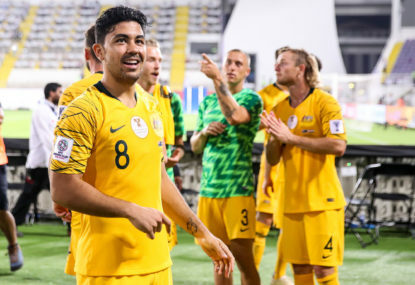 It wasn’t just the Emiratis cheering as the Socceroos exited the 2019 Asian Cup in the early hours of Saturday morning. After a pulsating start to the summer against India and the hit and giggle of the Big Bash League, Test cricket returns to centre stage, with Sri Lanka arriving to query another new look Australian Test line-up. Rewind back to 2006. 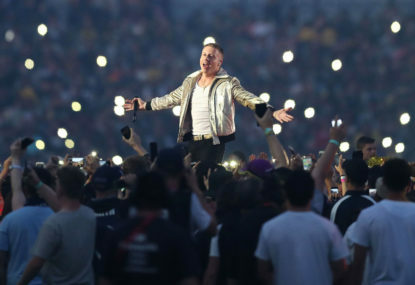 The night will remain etched in Australian sporting fans’ memories forever. 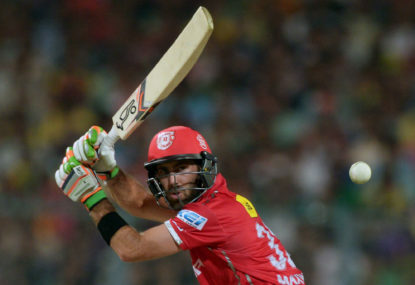 The IPL is back, bigger, brassier and bashier than ever. April 25th, 2018. The Imperial Hotel, Melbourne. 4:45am. I have never been one to spring out of bed early to get to the gym or go for a morning run. Yet this morning, the event makes the exception. “I hate [insert opposition team name]”. 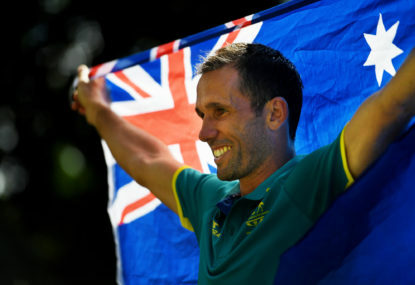 “The Common-what games?” This is the response I got from a bunch of ten-year-olds a couple of days ago when I asked if they were excited about seeing Australia’s best athletes competing on the Gold Coast for the next two weeks. Their confusion was genuine. 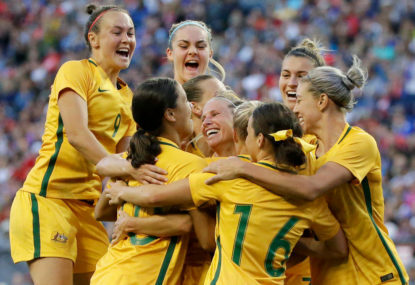 As the men’s national football side limped its way through World Cup qualification and into Russia 2018 last week, it was the women’s team that was promoting pride in Australian football. Rhythm, tempo and expression. Characteristics that are as essential to the success of a batsman as they are to a harmonic melody. On 23 November there will be a strong, talented and combative redhead walking onto the field for England. Forget the finals or the holidays, this is the most exciting and interesting time of the AFL year. This period, between the end of the finals series and the beginning of pre-season, is the silly season. It’s been a big few weeks for politics in sports. It is fair to say that six of the seven finals so far have been extremely underwhelming in this AFL finals series. 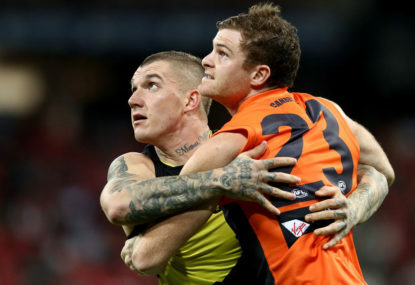 This is Dustin Martin. Don’t argue! What a year it has been for the AFL’s biggest star. 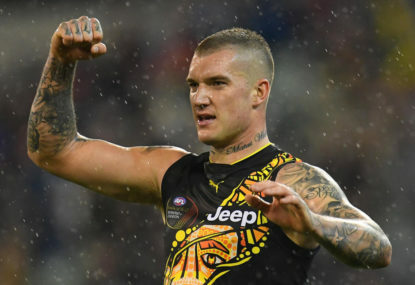 The freight train that is Dustin Martin has been running through opposition midfields all season, one fend-off at a time. AAMI Park is a proper football stadium, and the atmosphere inside yesterday evening did have an English football feel to it, was great to be a part of. It will be interesting to see if Kevin Roberts does take a different course to Sutherland. CA apparently conducted an expansive worldwide search for Sutherlands replacement, yet ended up promoting from within the guy long seen as Sutherland’s natural successor. Jury is still out, and I agree, he definitely needs a couple of seasons to implement his decisions before we can pass judgement. How they revamp the Big Bash following all the negativity around this year’s version without losing too many $$ will be the key to his tenure early on. Foxtel and Seven will be really pissed if they reduce the number of games considering how much they paid for the rights, but decreasing crowds, tv viewership and lack of international stars is really hurting the overall product. 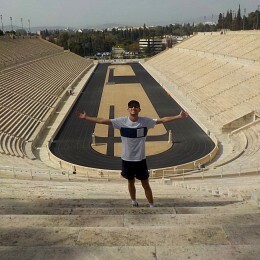 Next summer might be even more fascinating than the one just gone! Unfortunately the issues around selection I don’t have or ever will change. Being judgement-based there’s always an agenda behind certain players being picked or omitted, always has and always will.. Completely agree with regards to not explaining selections. Using a type of discount rate depending on the opposition or the number in the order you bat is farcical. Will they compare Burns’ runs against Sri Lanka equally against Harris’ runs across the summer against India when picking the Ashes line-up? One scored 180 when the team needed him, the other consistently threw away promising starts against both India and Sri Lanka. Hundreds win matches, and should get you selected, regardless of the opposition. Similarly, Wade has 571 @ 63.44 this summer in the Shield on the hardest wicket to bat in Australia. When you come in on a green seamer at 4/nothing each time you bat, surely that works in your favour and not against? Unfortunately Chappell’s changes re pathway systems, Futures League replacing State 2nd XI cricket, promoting youth and driving older players out of the system has been detrimental to the health of the Australian cricket system in producing high quality, hardened professional players. All selectors/administrators have an agenda, Chappell’s was clear for all to see. If there’s anything that the most basis research tells you, its that west Asian nations have considerable money and therefore influence in the AFC and within the walls of FIFA. Against India Hazelwood, the cartel failed to challenge the Indian top order’s forward defence enough. While the forward defence is suppose to be the batsman’s safety shot, it brings the most dismissals. Richardson came in yesterday and challenged Sri Lanka’s top order to consistently come forward and defend swinging deliveries, which they weren’t up to..
Should have showed more patience when bowling to Pujara, Kohli etc, but to be fair, I’d get bored bowling on a strip of tarmac..
CA snuggled right up to the BCCI, and got a nice big pay cheque for their efforts! No day night test, not playing in Brisbane, and the wickets we got were slow, low and generally lifeless, except Perth which had bounce and shock, we won! Yeah I would love to see Pucovski play, he has already shown in his few first-class matches that he has the ability to make big scores. 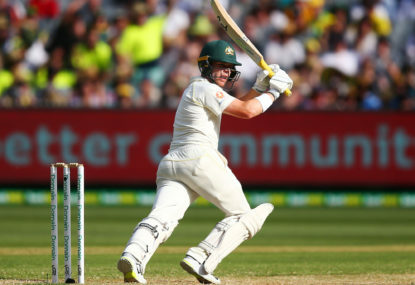 I suspect this season may be more for experience, but with Smith and Warner likely to be in the team for Pakistan and NZ next summer, that might be the perfect time to place him at 6 without too much pressure on him.. Absolutely agree spruce. What so many people don’t realise is that the players were never banned for ball tampering by CA, but bringing the game into disrepute. No certainly not the only one! Should David Peever have resigned? 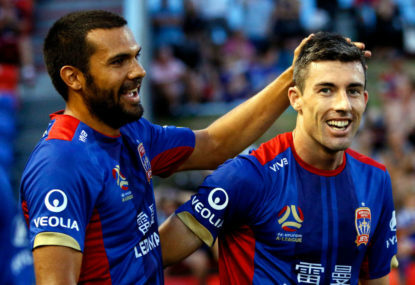 Peever was primarily responsible for driving the wedge between CA and the Players Association during the pay dispute last season, treating players as if they are standard workers in a large corporation like he is used to in his background. The cricketers are the only reason CA earns a cent, so it couldn’t be handled like any other union dispute. His handling of that was a farce, and has been held in contempt ever since. Plus, the cultural review being ‘conveniently’ delayed to allow his re-election before the Board could read it was sneaky at best, unethical at worst..
Really interesting article, and well researched! It’s not exactly an XI that will strike fear into Pakistan is it? Think the middle order role in the UAE will suit Finch more than opening up, so hopefully he and Head do well. 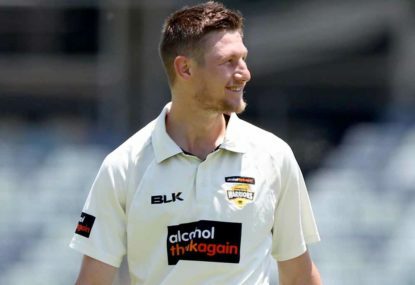 Holland deserves another crack at being Lyon’s partner, has been a proven first class wicket taker and playing mostly at the MCG, he has been taking them at the flatest, most dead wicket in the country. For that reason I’m surprised Tremain didn’t make the squad in the first place, makes things happen when no one else can.. I am worried for the Hammers. Pellegrini has major issues at both ends of the pitch, which were really obvious against Wolves. There seems to be no cohesion or plan as to how they play. Are they a counterattacking side, one that plays proper football? Against Wolves, time and again crosses were coming in from wide with not one West Ham player in the box. Arnautovic looks isolated and completely helpless sometimes. Difficult times ahead! Defensively the Hawks fell apart after Stratton went down. He has had an unbelievable year and was unlucky to miss out on an All-Australian guernsey IMO. I think they’ve moved away from any notion of ‘deliberate’ or ‘unnatural position’ when it comes to adjudicating handball in this World Cup. There appears to have been a clear directive from FIFA that if the ball clearly strikes the hand in the area, it’s a penalty – no questions asked. I personally think it was extremely harsh and definitely wasn’t intentional. But looking at the trend of this World Cup, the surprise was not that the penalty was given, but how long he took to give it.. It will be very interesting to see firstly if India picks him ahead of Ashwin. As you say Ronan, I think India still loves Ashwin’s ability to contribute with the bat, and by batting him at 7 it could potentially allow for the second spinner, particularly in Adelaide and Sydney..
Well said Paul. The selectors have had a very scattergun approach to ODI cricket, but in this instance there just isn’t the quality to choose from. Obviously the blokes chosen haven’t performed well – Andrew Tye in particular who is a proven white ball bowler but conceded 100 runs in this game – but when the first and second choice bowling line-ups aren’t available for selection, this is what happens! As for Faulkner, he has one trick with the bat and the ball. A slog to midwicket and back of the hand slower ball, that’s it. International players finally worked it out, and it was a surprise it took so long! I think your last point is the crux of it Kris. VAR was not brought in to re-adjudicate these 50-50 decisions. It’s for the Argentina non-penalty, and for the Sweden penalty awarded the other night. That’s what the technology is for. If it’s obvious from the first replay, change the decision, like you would for goal line technology and offside..
Would have thought inadequate camera angles available to the VAR is imperfect technology JamesH? The VAR under its current technological inhibitions and inconsistent use from one case to another, means it is presently unable to reliably adjudicate on such decisions. 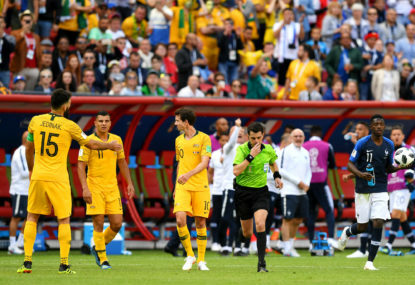 FIFA need to make their minds up as to what they want VAR to be: is it to ensure every decision is 100% correct, or is it intended to remove only major referee errors? Agar is definitely someone to persist with. ODI cricket these days, if he can snag a wicket or two per game and keep his economy under 6s, that’s extremely good going. 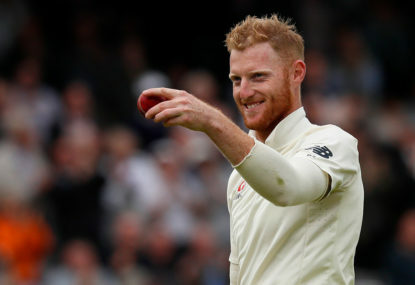 Plus he adds much greater batting depth and that clean striking ability is something that England clearly has over us at the moment… He’s the modern cricketer, and needs an extended run to demonstrate his talent..
Also, it is easy to forget how good a white ball player Shaun Marsh is. 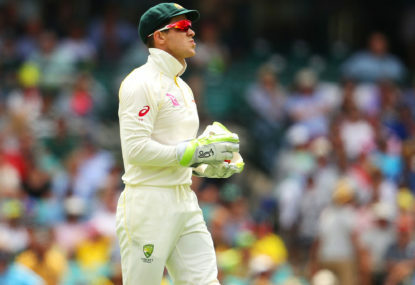 It’s very easy to be sceptical of Marsh because he can often get out to soft dismissals that belie his talent, but his record is impressive considering the stop-start nature of his career. I feel that Glenn Maxwell’s exclusion from the Australia A first-class squad puts a major dent in his test ambitions. 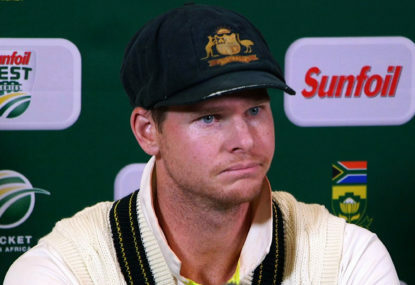 Heard him on radio last week saying how he was hoping to be picked for the A tour and press his claims to not only play in the UAE, but also his first test on home soil next summer.. There are so many out there just waiting to strike LeBron down, waiting for the one moment where he shows some sign of weakness. It doesn’t matter who is better out of LeBron and Jordan. They are the two standouts in NBA history, and who knows if/when we see another like him again. Appreciate the Greatness that is before us now, because he’ll be gone not before long..